Check out this Dont Step In It (poop) game– one of the hottest games this season! 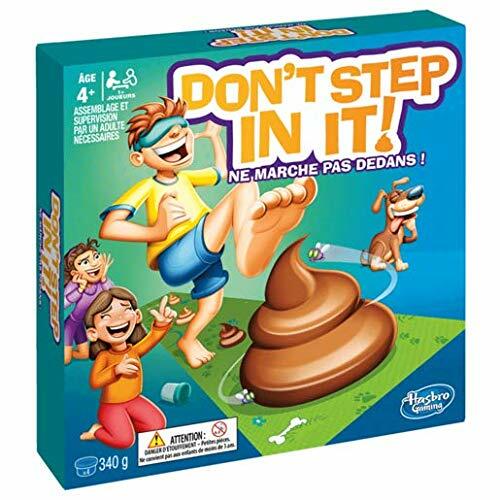 One of this years hottest games is a Hasbro Game called Dont Step In It Game! Be careful not to poop out while playing this hilarious game with messy consequences! In the Don’t Step in Poop game, players try not to step in the poops as they walk along the mat while wearing a blindfold. The laugh-out-loud game is for ages 4 and up, and easy to play. One player puts on a blindfold. Another player spins the spinner, and the blindfolded player has to take that many steps across the game mat. But watch out! Little piles of compound, molded in the shape of poop have been strategically placed on the mat. Sometimes players will have to add a poop, remove a poop, or even re-arrange the poops along the mat. Who can avoid the number twos to be number one to win? This Don’t Step In Poop Game is projected to sell out this season! Check the stores below to see if they have in stock and get yuors before its sold out!